Safe and healthy pet food starts with safe ingredients sourced from well-monitored suppliers. There are many different feed ingredient products available and when looking at the market, there is no easy way to make your choice. Each nutrient in the ingredient plays a different role in the pets body. To get the best quality food you need to find ingredients with high quality, with the right nutrients, in right amounts, and you must have the correct inclusion or ingredient proportion in the food. It is very important that the quality of the pet’s food is maintained to ensure that the pet gets the right amount of nutrients in their body. In a pet’s world it is not always “the more, the better”. As a breeder you need to choose what kind of nutrients and vitamins you want to focus on and then find out what is the right amount to implement in the food for different types of pet’s. For example a balanced diet that provides about 10-15 percent fat is essential for health in the majority of adult dogs (source). Each vitamin and mineral plays a different role for the body. For example, vitamin E is important for dog’s immune system and vitamin A for maintainance of healthy fur and skin. To get these two ingredients in to pet food you need to include fruits and vegetables (source). Bioavailability refers to the pet’s ability to absorb the vitamin or mineral in their food. If the pet is unable to absorb the nutrients in their food it will be unable to make the best use of them (source). Therefore, you need to choose ingredients with high bioavailability as it has direct impact on the efficacy the ingredient and therefore health. The bioavailability of a nutrient is largely determined by the properties of the dosage form, which depends partly on its design and manufacture (source). This is why it is important to take into account the bioavailability of the pet ingredient. It is important to protect our oceans and ecosystems by choosing ingredients from marine feed that are sourced from a sustainable fishery. To take sustainability into account is important both for the protection of the oceans and because customers care for companies that care for the environment. To ensure that the marine ingredients in pet food formulations are sustainably sourced you can search for suppliers that are MSC (Marine Stewardship Council) certified. The council ensures 100% sustainability and traceability of products. By choosing a sustainable marine source, that is certified by the MSC, you are ensuring that the marine biomass in our oceans can be kept at healthy levels. Organizations such as the MSC are constantly working to improve the sustainability of fisheries. Just like their pet parents, dogs’ are unable to make omega-3s internally and they need a food source that provides them with these essential fatty acids. Omega-3 should therefore be an absolute ingredient in all pet food. 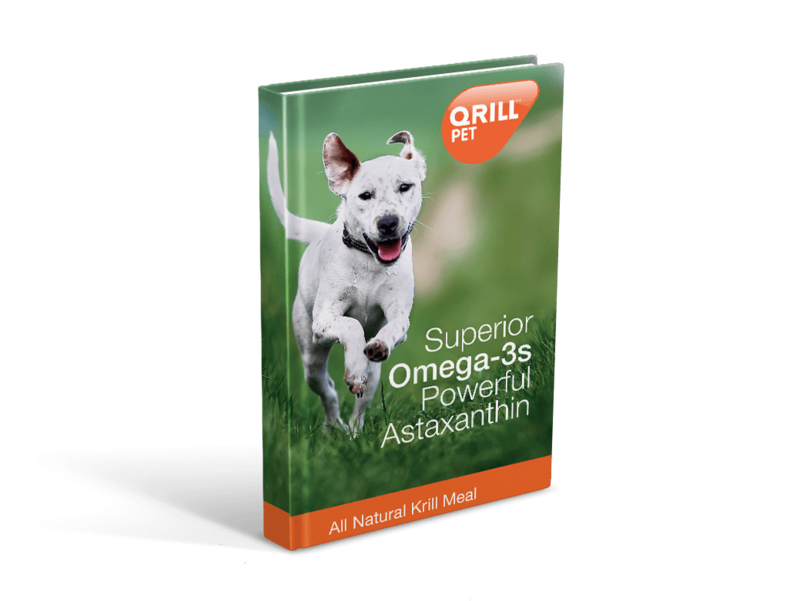 Antarctic krill is a new and effective omega-3 ingredient source in pet food. What makes krill omega-3s unique is the format by which they are delivered. Krill omega-3s are mainly found in the phospholipid form. Phospholipid-bound omega-3s are more efficiently incorporated into the body’s cells, tissues, and organs. Furthermore, krill's omega-3 phospholipids are water soluble, making them gentle on pets’ stomachs and readily absorbed by their body. Due to it's natural components, krill delivers much more than just omega-3s. It is also a natural source for choline, marine proteins and the antioxidant astaxanthin. Antarctic krill is also a 100% natural source for pet food formulations and represents a high-quality addition for healthy pet food products.